I love making my own sausages. I have a meat grinder and sausage stuffer attachment for my KitchenAid. It is great fun and you can make whatever flavours you like. This halloween I was trying to think up things to make from my kids pumpkin leftovers that was the usual pumpkin soup. 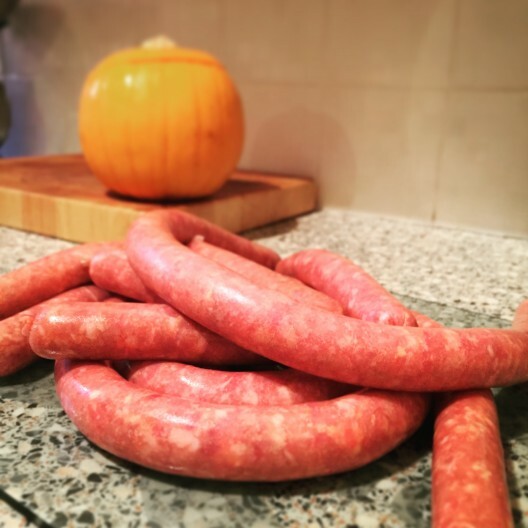 Hey presto Pumpkin Spiced Halloween Hotlinks. 100ml of your favourite ale. Dice up your meats and then put diced meat through the mincer a couple times. Add all the other ingredients a bit at a time then mix it all then add another bit, ensure you have an even spread of all the ingredients. Stuff your sausages as per your sausage stuffer instructions. Once the sausages are made allow them to rest in the fridge for a few hours or preferably over night. Smoke your sausages for a couple hours at around 220F. Bring your BBQ temperature up to a higher temp around 350F for the last 30 mins.